Imagine my disappointment. I got to the Portland Red Carpet Club this evening and was informed that I had been downgraded on my redeye from San Francisco to Washington Dulles. 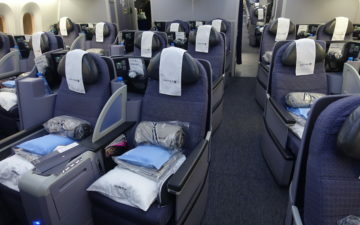 I had a confirmed first class seat on the flight, which was a domestic 767, the worst plane in the fleet. But first class is first class. The agent printed out my new boarding pass as she profusely apologized for my downgrade. Imagine my surprise when I saw “UNITED BUSINESS” printed at the top of the boarding pass. As it turns out there’s a swap to a three cabin 767. So instead of an uncomfortable domestic first class seat I’ll get a good night of sleep in a flat bed tonight. 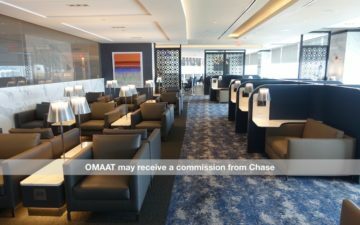 you wasted used upgrade instruments on a domestic 767 redeye? Granted it all turned out ok, but I certainly wouldnt have used them. I agree, but all upgrades cleared before I checked in, so I got PDX-SFO-IAD-TPA for five 500ers. Otherwise I wouldn’t have done it. I missed you ahhh… I was in SFO RCC this morning! F is still F! I can’t imagine someone who rather prefer Y over F.
More legroom in Y but skinny seat, not me! If you fly to Hawaii frequently you get to know the ghetto 2-class very well. There are some F seats that are passable on a red-eye. Congrats! Equipment upgrades are always a treat. I had the same thing happen to me IAD-SFO last night. A 3-class instead of a 2-class. I was happy to hear the flight time was expected to be 5.5 hours. However, they got us in 45 minutes early. Darn it. I did get to watch 2 movies, 1 tv drama, 1 sitcom and play around with a couple of the games. It made up for me not bringing my iPhone connector cable. I have to remember to pack that at all times because you never know when a better plane substitution can occur. Just 2 days after you say you don’t want to fly F and already you have gotten your wish! 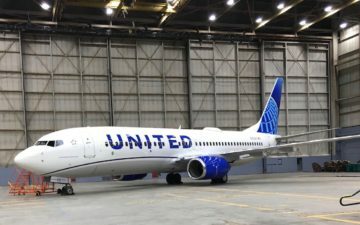 United considers one ‘first’ and the other ‘business’. Several of my friends have been pleasantly surprised flying to PHX or West Coast w/ DL using an intl configured 757 instead of the domestic ones recently. They were happy as well. And that’s only part of the compensation…. @lucky — And we wonder why United is going broke. Morons. Hey there, Lucky. So glad that we downgraded you! No surprise that there’s a big difference in experience between the domestic 767s/777s and those configured with three cabins. (But @Pat, c’mon, “ghetto” is too strong a word. Cut us a little slack.) Later this year, we’re beginning a cabin refresh, so look out for leather seats in F on an increasing number of airplanes. Stay tuned… and thanks for your business. Any idea what triggers the automatic compensation emails and mileage deposits? I’ve never had anything post automatically in mechanical delay situations, etc. On a few particularly egregious examples, I’ve either gotten Skykits or written an email to 1Kvoice, but nothing proactive. Will they provide a better service/treatment for us too? Actually, I’ve been on several UA domestic flights, with domestic aircraft, where the F seats have been recovered in a navy-blue leather. Empower sockets were also working on these planes, and the in-flight service was outstanding. So I agree with UnitedPR that things are on the upswing at United just now. I want a trip report of the Portland visit! I think Portland is definitely up there in terms of being one of UA’s best stations. @UNITED PR. Take my word for it as a 1KMM. Fly regularly between the west coast and the Islands on any of these 2-class birds (as I do) and you will soon be saying the same. Maybe you need a little more time out of the office and more on flights (dare I say). I was on a 777 last month that had the leather seats and still had the horrible projector screen. I had to avert my eyes the whole time as I was in the bulkhead row and the permanently damaged screen with the out of focus picture was giving me a headache. I was dumbfounded that they did not convert the displays at the same time. You can’t judge on one wonderful flight and simply rated UA is the best. with 8 transcons just this month, overall I just had an ok to average service and nothing to brag about. I know we do love UA, i meant the SWU not the airlines, pardon me. My DEN/ORD tomorrow has been downgraded from the new 767 to 752, now back to high school chair.